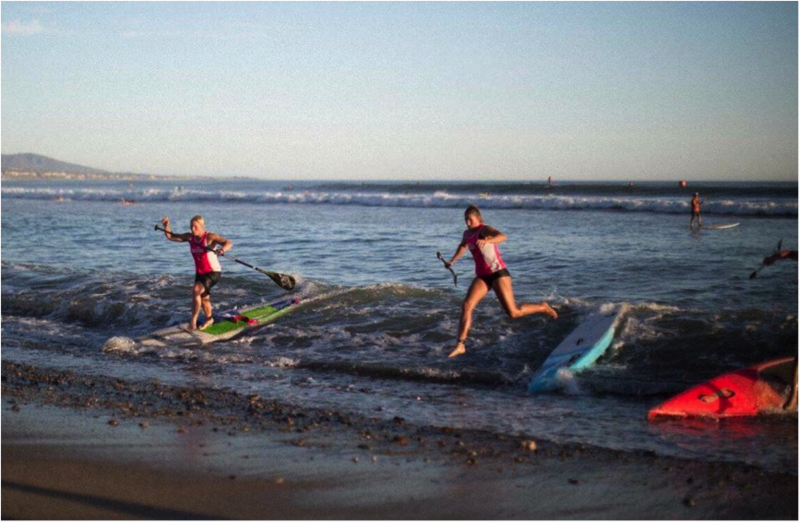 After a long successful day competing in Ventura, it was time to get ready for the biggest SUP race of the year, the Pacific Paddle Games Dana Point 2015. We packed up our things and headed 4 hours back down the coast, to spend the night in Huntington Beach. When registering online a few days before, we were warned that there was going to be big swell and that PFD’s and leashes were advised! Another early morning, as we loaded up the race boards and headed to Dana Point. The parking lot was full, as thousands of people moved in and out of the venue. We lugged the boards down to the site, where it looked as though a massive festival was about to happen. A huge tower structure with gazebos lined the beach for a mile. 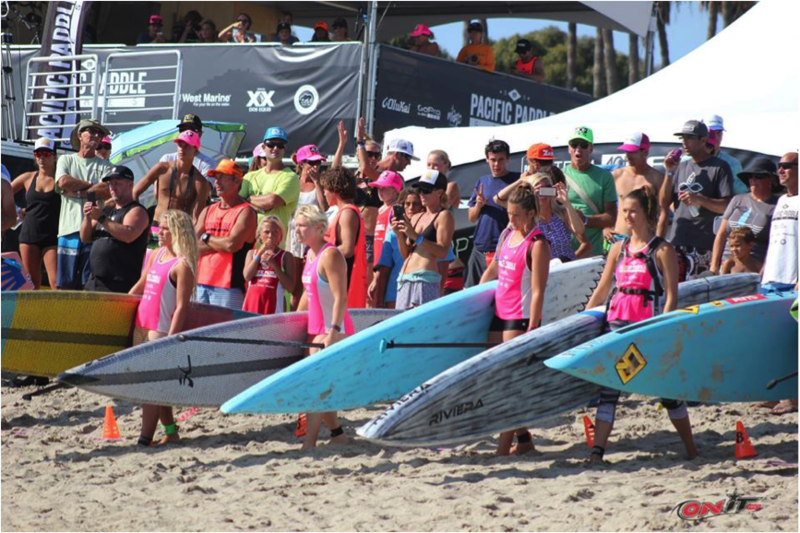 SUP athletes and enthusiasts gathered from far and wide to test their skills on the biggest stage and retailers gathered to show off their merchandise. 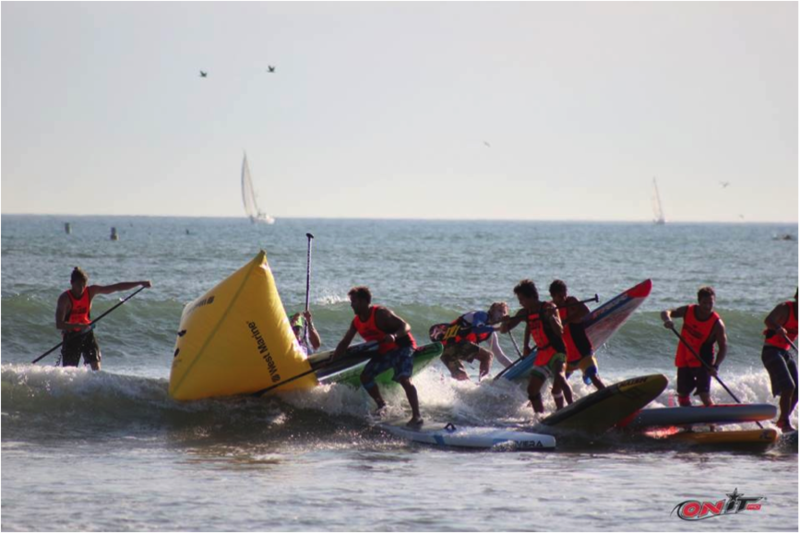 We stood and watched the earlier heats, where the amateur open men’s division had over 100 participants, while the grom division also had loads of super talented kids, some as young as 8 years old braving the solid swell but not before strapping on their helmets for safety. As the day got hotter and hotter, we began to prepare for our races. 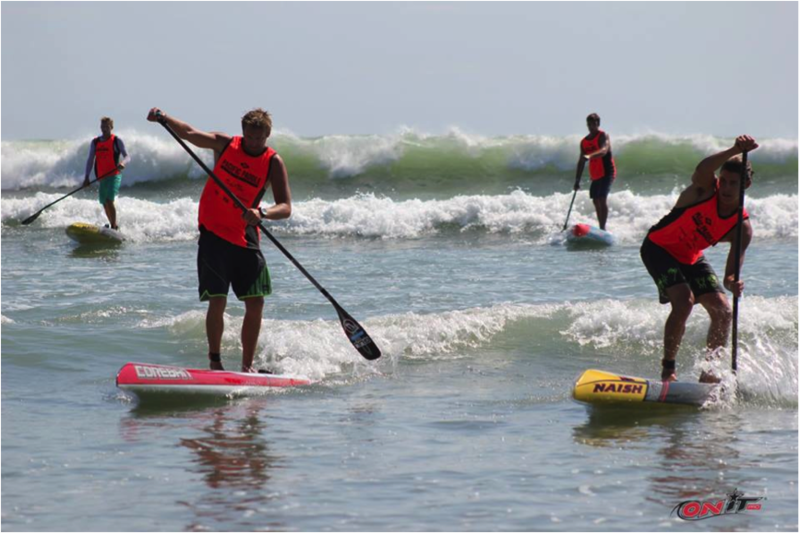 I was up in heat 1 with another 25 of the best paddlers in the world. After our repo charge exit in Huntington during the sprints, we weren’t expecting too much. But we did pay $250 to enter so we were sure going to give it our all and show the world SA’s talent! We drew our random lane numbers and lined up at the start with the crowds gathering on either side as if it were some kind of gauntlet. I drew number 16 and lined up in my lane next to Danny Ching, arguably the world’s fastest paddler, but can he run I thought? There was a 25m sprint to the waters edge… that would be my chance to get ahead if there ever was one. The siren sounded and off we went, as I found myself in front of the pack. It’s really tough on the cardio to go from a 25m sprint run into a 100m-sprint paddle. I found myself being caught very quickly in the paddle to the outside buoy. I hung with the top group for a while before getting caught up in the chaos on the buoy turns. The top 10 advanced and I came in 11th. Luckily there was a repo charge round to give me another shot! 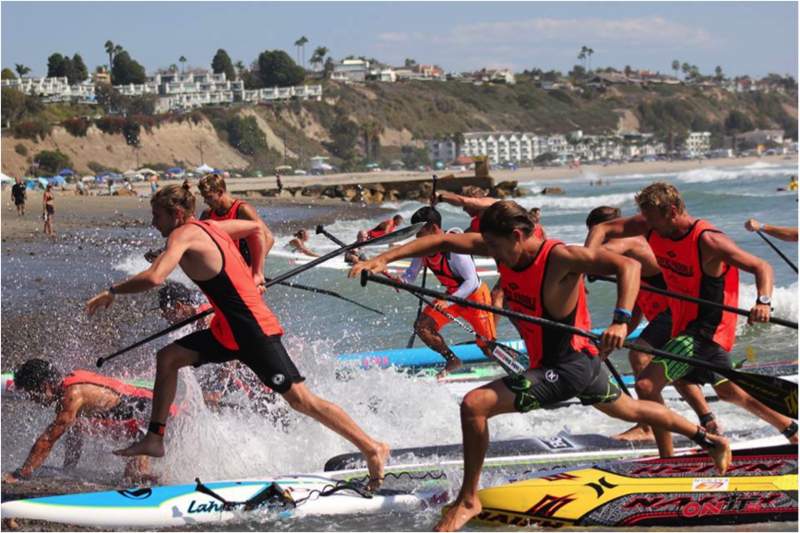 Although it was a sprint paddle, being a fast runner helped, especially when there were 15 people on 1 wave coming in, and only 10 qualified. Tom’s heat was up next and with no one really giving him a chance, there was nothing to lose. Back on the more familiar 14 foot race board, which we definitely felt more comfortable on. Another stacked heat, as Tom didn’t have the best start. But with some tactical buoy turn techniques to avoid the chaos, he found himself coming in just behind Connor Baxter, much to our disbelief! 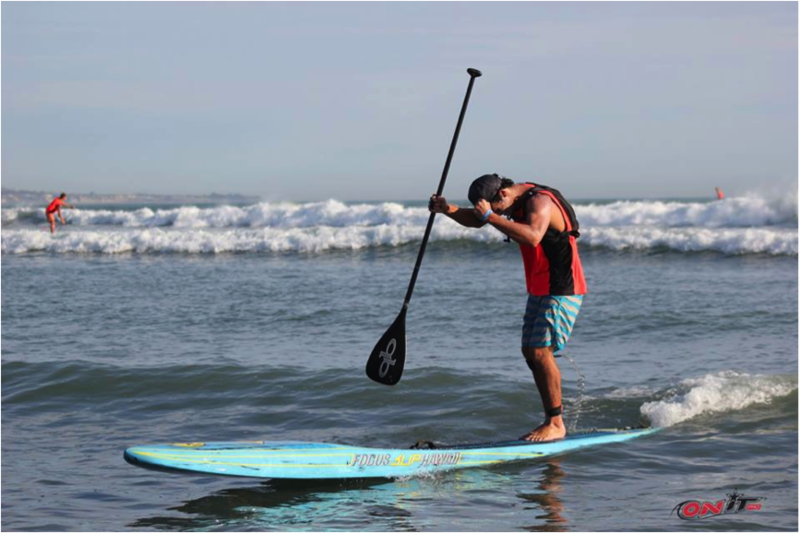 He finished 3rd in his first heat, taking out some of the biggest names in Stand Up Paddleboarding. This definitely motivated Tarryn and I to go even harder in our heats. 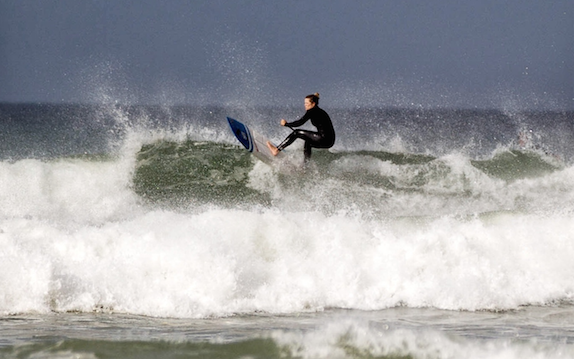 Tarryn was up next on her Coreban 12’6. She had a great start, but got caught in the waves and found herself in the back half of the race. She needed to finish 10th to advance to the final and was sitting 13th for the majority of the race. Missing a couple of crucial waves, Tom and I were pulling our hair out. 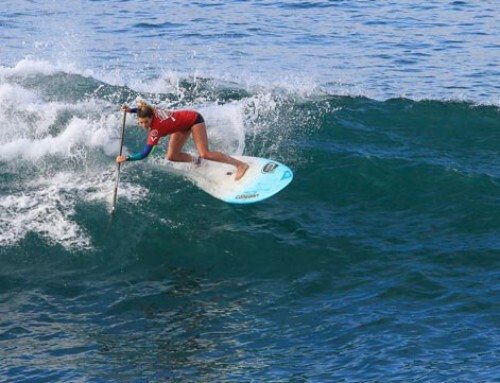 She dug deep to catch the most important wave, that helped her join the other 2 girls fighting for qualification. 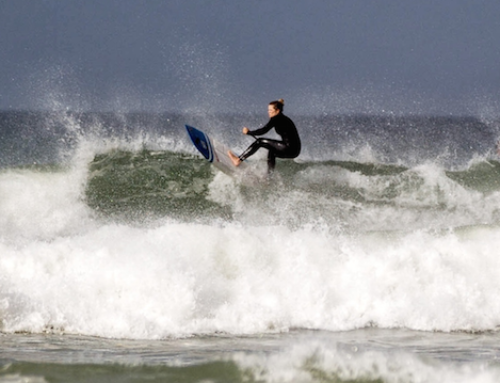 Some of the waves were running for over 150m, so if you could time getting on to one of these, you could save a lot of energy and make up a couple places. It was down to a sprint finish, one that we knew Tarryn would have the legs for, as she left the other 2 girls in her dust, to narrowly earn her spot in the final! Tarryn, timing her dismount perfectly, to give her a clean run up to the beach, to advance into finals. I had one more repo charge heat to get through. They shortened the course, as the sun was going down and they needed to get through more rounds. I had no energy left but pushed on, after all the mess I found myself on a wave with 15 guys that would determine semi final qualification. I made the sprint up the beach just ahead of the pack, super relieved to qualify for the semi finals the next day. Day 2 and the swell was still pumping. It was time for the 6 mile long distance course. We were glad that it was early in the day as it wasn’t too hot yet. It was a water start, which was manic, with so much water moving around. It was hard work finding a draft, but once on, there was no giving up. The front pack sped off at a ridiculous pace, so I had to settle for a draft further back. A bit of swell movement provided a bit of relief, linking up some fun runs along the way. It was a super tight finish for the men’s and woman’s race. Danny Ching, after leading most of the race, was pipped by Connor Baxter with a sprint finish to the line. The ladies saw the top 5 girls coming in on the same wave, after 6 miles, with 2 of the girls falling and Candice Appelby winning the sprint up the finish. Having waves in a race definitely makes for entertaining viewing. Connor pips Danny in a sprint to the finish. When Connor was asked how he beat Danny in the sprint up to the beach, he said 2 words : “longer legs”. It was semi-final time and the crowd on the beach was just getting bigger. Both Tom and I were just stoked to make the Semi’s and anything more would be a bonus. Top 15 would advance to the big final, so we knew we had a small chance. 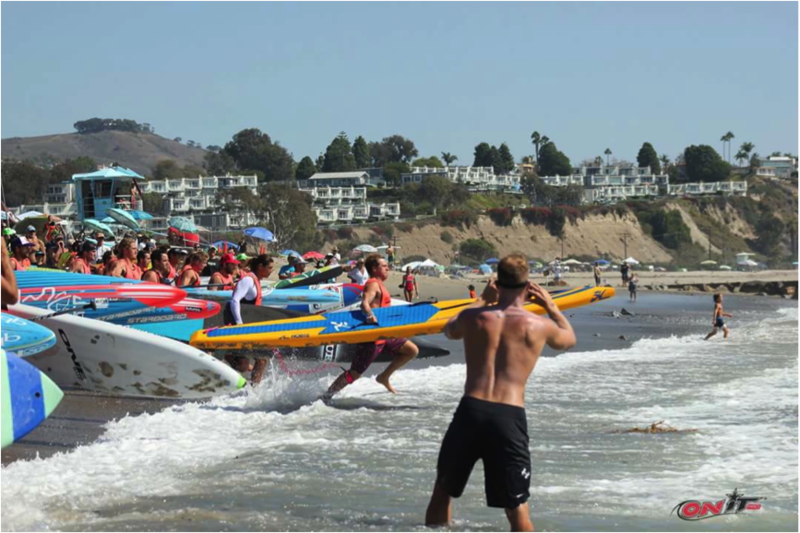 With 30 paddlers on 14 foot boards, all aiming for the same buoy, there was bound to be destruction. Using Tom’s advice for buoy turn strategy in the surf and avoiding the destruction, I found myself just having to hang on in the straight sections as this is where the top paddlers made up their ground. After avoiding boards and paddlers, I looked up on the wave in and on either side of me was Danny Ching and Connor Baxter. I just had to hold on to the wave to qualify for the final. 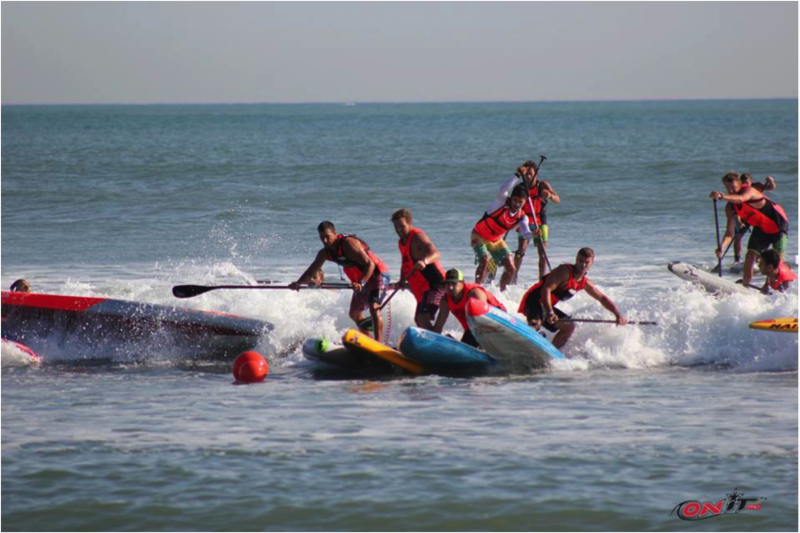 Even though I had qualified, I took to a sprint finish as this would probably be my only chance to beat these paddlers as I came in at second infront of Danny and the remaining paddlers. A result I’m going to frame, haha! Stoked to be racing with and beating some of the legends of the sport. Toms semi was next and after looking a bit wobbly at the start, he fought his way back in to the front group making up a lot of ground going out through the waves where a lot of guys were falling and wobbling he stood solid and cruised in to the leading pack. Coming in on a family wave, it came down to another sprint up the beach where he powered up the soft sand to join me in the final. 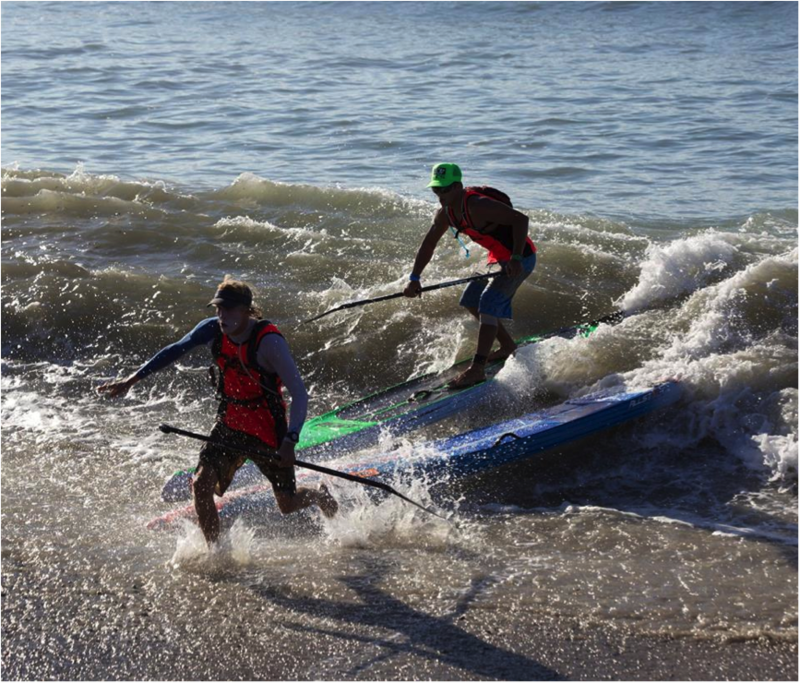 We were both frothing on making the finals of the biggest SUP race event of the year. We had definitely worked hard for it! Tom sprinting to qualify for the final! Timing your dismount was essential to avoid falling into the big hole before the beach. Ladies final line up for the start of the final! The ladies final was next and consisted of 3 laps. After a full day of paddling, this was going to be hard, especially going at a racing pace the entire time. Tarryn had a great start as they started the girls on a set, she managed to hold on through the white water and get to the backline. Candice and Annabel sped off in a league of their own, as they exchanged the lead back and forth the entire race. 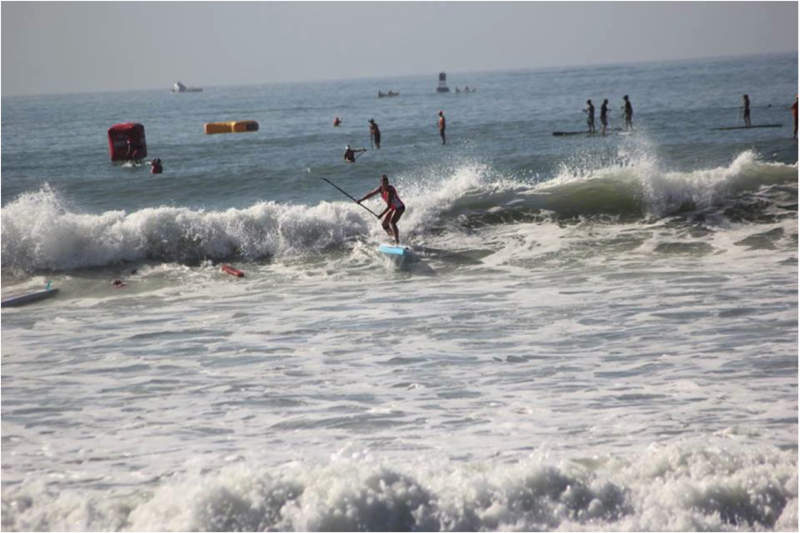 Tarryn locked into a bomb wave, half way through the heat, as she rounded the outside buoy. Heading across the bay, she went to the wrong buoy and had to backtrack to round the correct buoy. She paddled her guts out and finished a respectable 10th and that would mean she would finish 10th overall. After her long distance result, 10th at the biggest event of the year, with the biggest names in the sport is quite an achievement! Tarryn, easily punching through the white water, while the remainder of the pack have trouble navigating through to the backline. Coming in to the finish in style. Being a surfer definitely helps when it comes to this format of racing! 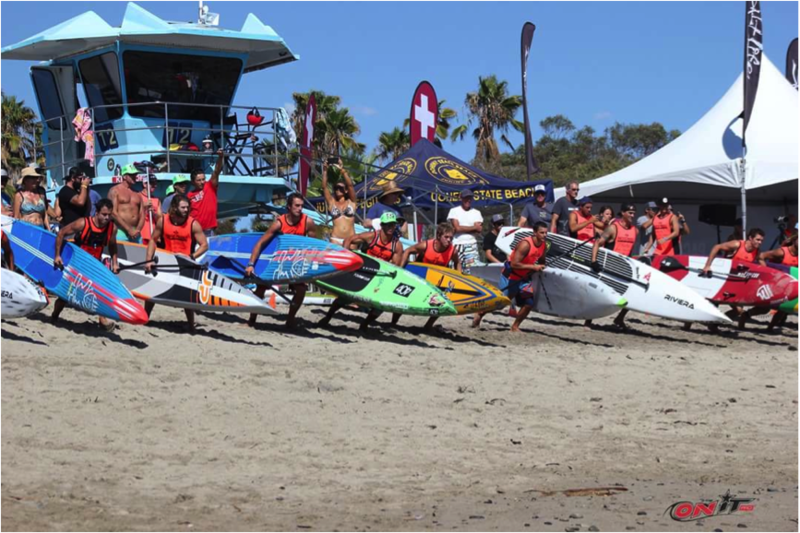 30 paddlers gathered for the Mens grand final at the PPG 2015. Tom and I drew numbers 29 and 30, and lined up on the outside lanes, next to Casper Steinfath of Denmark. Another crazy start! As we headed around the outside buoy, I saw a wave approaching and decided to wait, while a couple of the paddlers tried to beat the wave to the inside turning buoy. 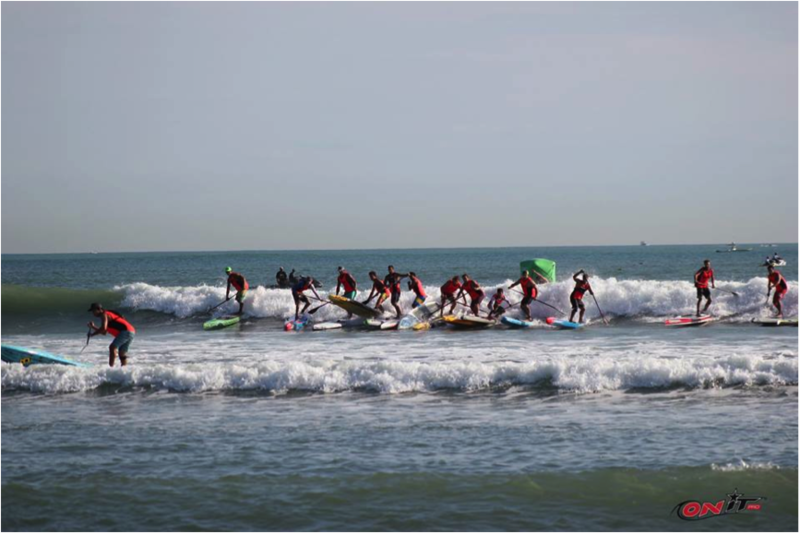 Next thing 23 guys were all on one wave, a record number of paddlers on a single wave in a race! As we all had to head to one buoy, boards were crossing over, people falling off and getting tangled up. I remember holding my paddle in one hand and using my other hand to cover my head as I got hit in the head 3 times by different buoys. Taking on a “bos kak” stance that not even a 20 foot wave at Dungeons could knock me off I made it to the buoy with another 4 guys remaining on the wave. Getting taken out from all angles in the middle, while Tom takes the safer outside line to the buoy. Fighting to get the inside line on the buoy turn. The 3 laps felt like a long distance race, as your lungs are burning and muscles start to seize up after a long weekend of paddling. I missed one important wave, by getting caught inside as it stood up on the reef. These races are all about who can make the least amount of mistakes. On the day that person was Mo Freitas who came out on top in a dominant performance and a much-deserved win! Mo super stoked on winning the sprint race after a dominant performance! 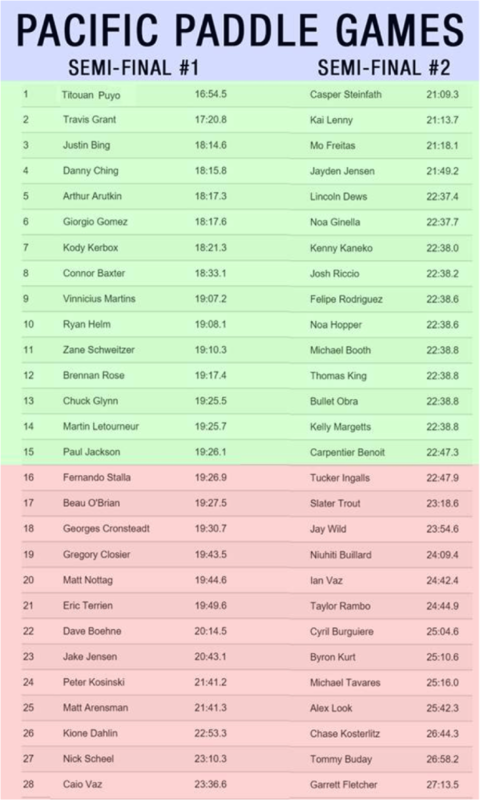 I finished 30th overall, with Tom finishing 35th. Connor Baxter took the overall win in the men’s, while Candice Appelby continued her dominant performance in woman’s Stand Up Paddleboardng, taking a $11000.00 cheque along with her overall win! 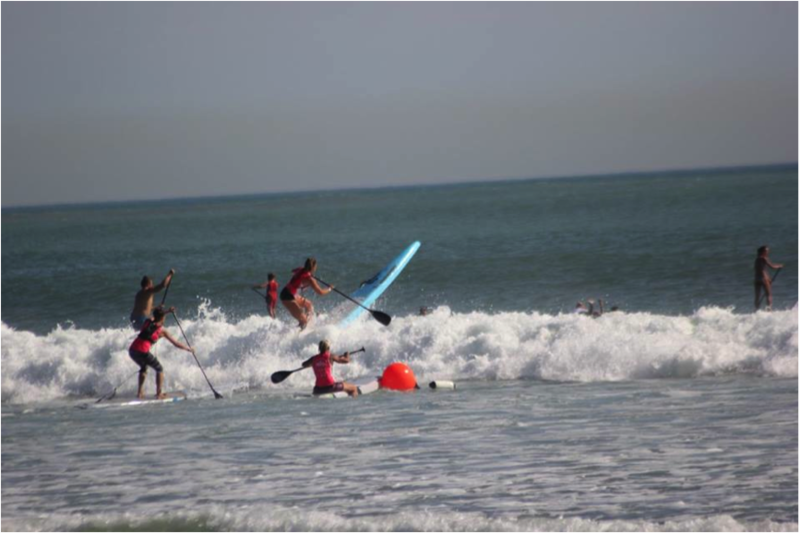 What an amazingly well run event, one that every Stand Up Paddleboarder should tick off their bucket list! We’ll definitely be back next year.